Today’s technology landscape is complex and disruptive. As organizations become more digital, security has to be more than a department or set of loosely-integrated solutions to keep up. 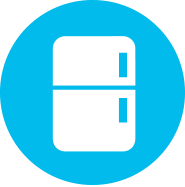 It has to be a total philosophy, worked into everything from product design to development and deployment. Start to finish. End to end. 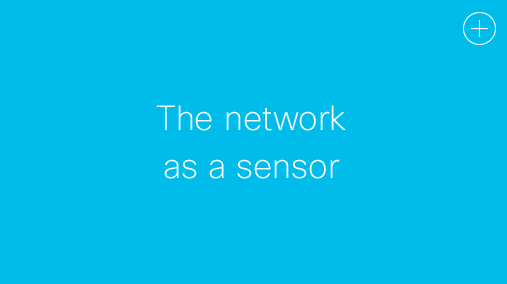 Everything your network touches adds another layer of risk. 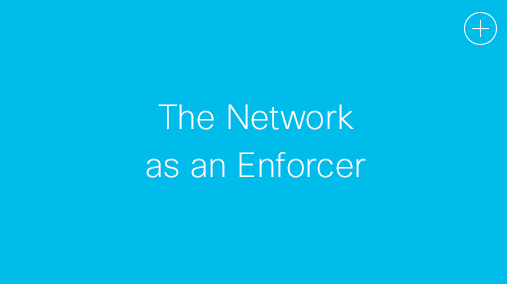 Traditional methods like perimeter defense don’t cut it, and outdated infrastructure can’t handle new network security requirements. risk. Traditional methods like perimeter defense don’t cut it, and outdated infrastructure can’t handle new network security requirements. 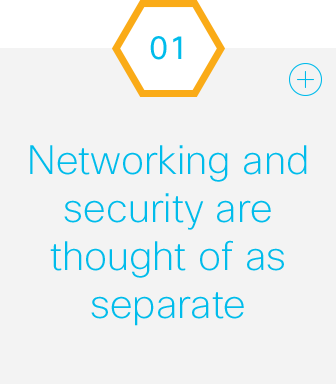 Security shouldn’t be an afterthought, but a lot of networks rely on off-the-shelf components that don’t tie to an overarching security strategy. The result is a security patchwork. 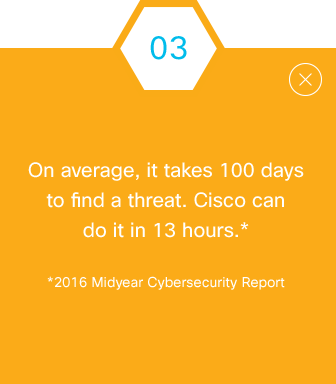 See how Cisco performed against competitors in the 2016 NSS Breach Detection Systems Test. Security should be baked in. Some tech companies see security as the frosting on top of a cake. 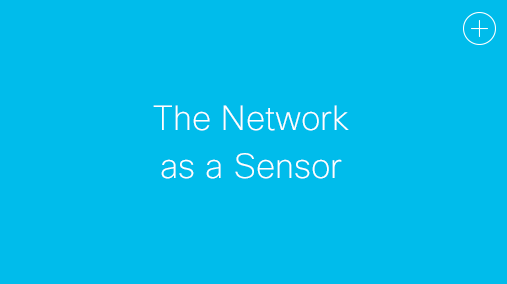 Cisco bakes it into every product at every layer. Cisco Digital Network Architecture (DNA) integrates critical innovations in networking software into one architecture. 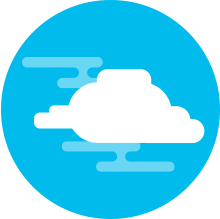 These innovations let you rapidly detect and contain threats, control network access, enforce security policies, and help meet compliance requirements. into every product at every layer. Cisco Stealthwatch opens the network to total, real-time visibility. 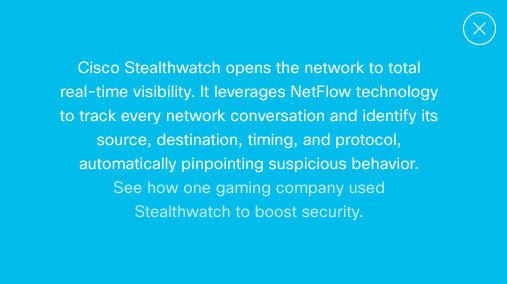 It leverages NetFlow technology to track every network conversation and identify its source, destination, timing, and protocol, automatically pinpointing suspicious behavior. 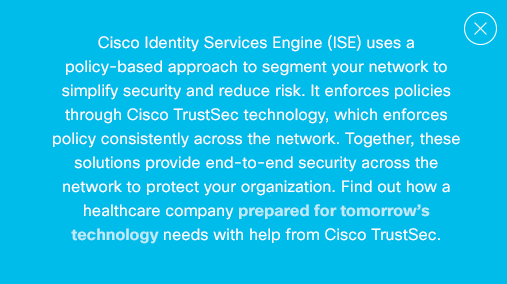 Cisco Identity Services Engine (ISE) uses a policy-based approach to segment your network to simplify security and reduce risk. It enforces policies through Cisco TrustSec technology, which enforces policy consistently across the network. Together, these solutions provide end-to-end security across the network to protect your organization. Find out a healthcare company prepared for tomorrow’s technology needs with help from Cisco TrustSec. 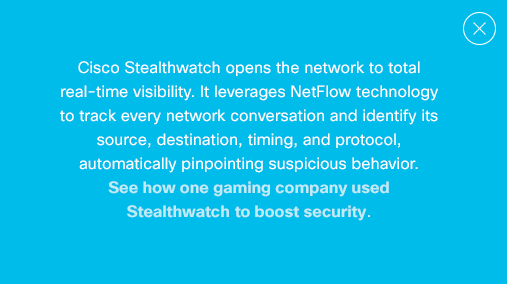 See how one gaming company used Stealthwatch to boost security. 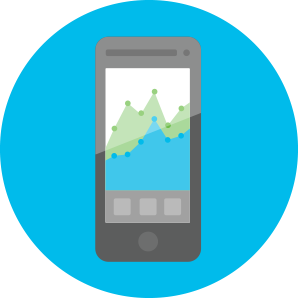 Cisco Identity Services Engine (ISE) uses a policy-based approach to segment your network to simplify security and reduce risk. 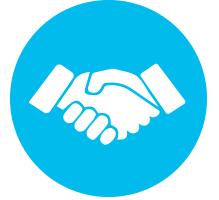 It enforces policies through Cisco TrustSec technology, which enforces policy consistently across the network. 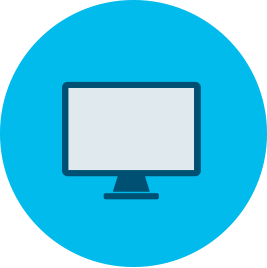 Together, these solutions provide end-to-end security across the network to protect your organization. 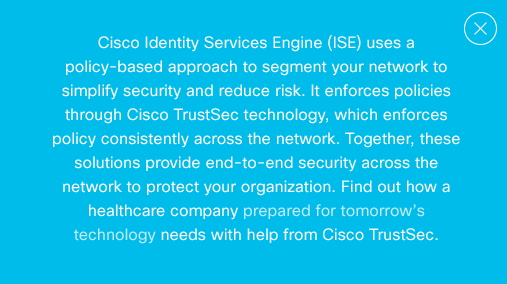 Find out how a healthcare company prepared for tomorrow’s technology needs with help from Cisco TrustSec. Get detailed, real-time traffic visibility. Find out why Cisco’s philosophy of security-based design is the key to a robust defense.